The Silver Bullet throttle body spacer is constructed from precision machined T-6061 billet aluminum and is designed using a serrated/helix design that creates turbulence in the air flow at the point just prior entry into the engine optimizing the combustion cycle. This turbulence helps the air/fuel charge burn completely providing increased horsepower, torque and improved throttle response. In recent testing this spacer produced 6 Horsepower and 13 lbs. x ft. of torque. This spacer was dynoed with a aFe OER air filter and dynamic air scoop. 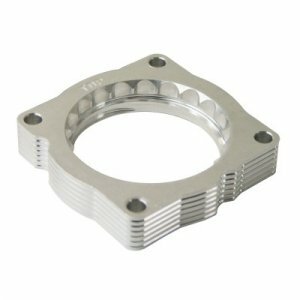 This throttle body spacer is 50-state legal (CARB E.O Number D-550-11).